Junior Christian Janke soars above the net in preparation for a kill. 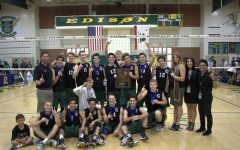 From league champions, to winning CIF, the varsity boys volleyball team is looking to keep their momentum going into the 2017 season. 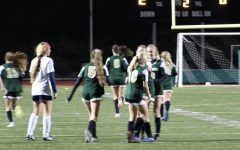 In Thursday’s energetic home game against Cathedral, the Bobcats showed their fans how they are looking to surpass these huge expectations. 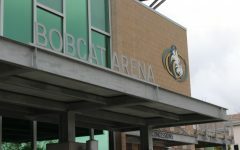 During warm-ups for the game, both the Bobcats and the Dons had massive angle strikes which rained down on the court. For the Bobcats, freshman libero Matthew Oakley mentioned what it is like to play on varsity against an established program like Cathedral. 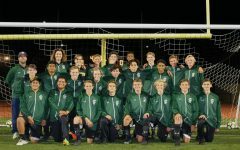 “Cathedral is a really well known program and it is great to play against these guys. Being a libero on a varsity team is a difficult responsibility. Your teammates rely on you to make plays and you rely on them,” Oakley said. As the first set came, fans got a sense that the Bobcats were fired up for this match-up. 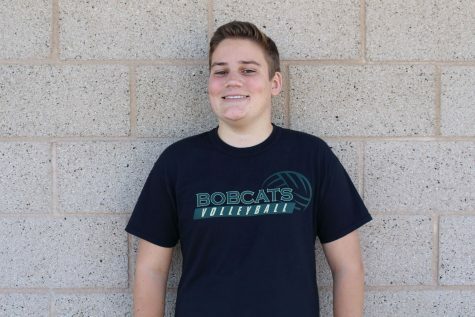 Senior outside hitter Ryan Yates came out within the first 12 points and got two kills with three blocks as the Bobcat bench and arena uproared in cheer. 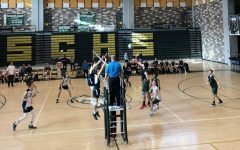 Within the next couple of points, junior Christian Janke and sophomore middle Jon Ulrich came up with key kills on account of Oakley’s phenomenal passes. Overall, the team served very well in the first set, especially sophomore Garrett Edwards and Janke who served a couple aces. The first set ended with a score of 25-23 as Sage rides into the second set with momentum. 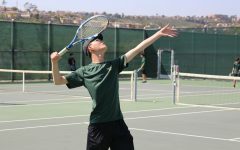 Sophomore middle Jon Ulrich uses his approach to hit a three- ball set by junior, Christian Griego. 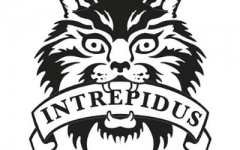 The second set began with the decline of the Bobcats passing. 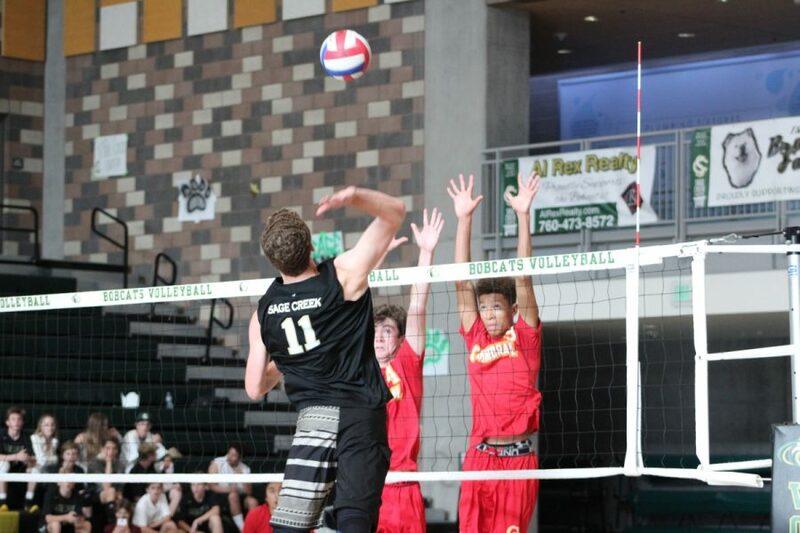 The boys started to struggle as Cathedral’s outside hitters angled their hits along the net throughout the set to compensate for Sage Creek’s great blocking up the middle. Coach David Savage called a timeout and assistant coach Jason Sebastian tried to pump up the team and highlight these errors that could easily be fixed. 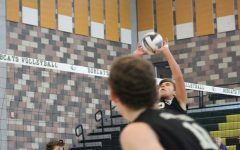 As the Bobcats battled back with kills by junior opposite hitter Ethan Shoemaker and middle Braden Brasher, it came down to Janke serving for the momentum swing play. Janke tossed the ball into the air and smashed it directly into the net, giving Cathedral the set, 25-22. For the first point of the third set, Janke smacked a set right into an opposite hitters’ head on a fantastic set by junior Christian (go-go) Griego. On the next few points, Yates tag teamed with Janke on more angled kills. During the middle of the set, a free-ball came over and Oakley passed a great ball to Shoemaker who struck a hit into the back corner for another kill. 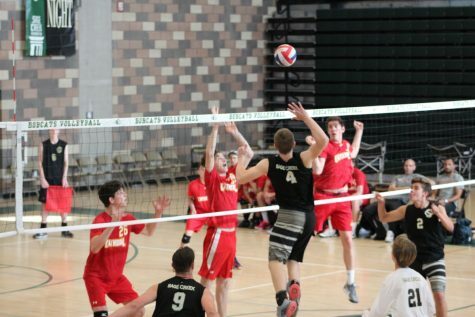 Junior outside hitter Ethan Shoemaker (#7) and middle Jon Ulrich (#4) look to block Cathedral’s outside hitter. In addition to that play by Oakley, Sage Creek went on a 6-0 run after trailing behind. Griego began to use his advantage as a left handed setter to use a sneaky dump which got the Bobcats within one point of the game. Once again, the serving got the best of the Bobcats. Yates approached the line for the jump serve as he served it into the net just as Janke did in the last set. Cathedral took the third set 25-23. At the 7-5 score mark in the fourth set, Yates had a momentum swinging stuff as SC began to take the momentum from the Dons. The next play, Janke overpowered Cathedral with a leap and a swat that sent the ball straight down to the floor. In addition to that fantastic play, Janke won the jousting match for another block to forge the Bobcats closer to winning. With the fourth set nearly won, Edwards lead the Bobcats on a 8-0 run with Griego, who set stellar four and five balls to the hitters that got the Bobcats a 25-19 win to tie up the game. Junior outside hitter Christian Janke leaps up to a go-set from junior Christian Griego over two outstretched Cathedral blockers. In the final set to 15 points, there was a great rally for the second point between the two opposing outside hitters as the Cathedral opposite eventually blocked Yates. However, Yates got his revenge on the next point when he fired back with a crafty roll shot. In the next couple of points, Griego placed an incredible set to Janke who slammed a destructive hit to make the Cathedral defensive specialist hit the floor. Also, Yates set a kind of “lob pass” (shank pass) to Janke who again drilled it down. For the final two points of the fifth set, Ulrich got the final two kills due to Griego’s fantastic sets. “I knew that our guys were really good and to defeat a respected and great program like Cathedral is really inspiring especially to our players. Our guys are amazing, our fans our amazing. It is just a great feeling,” Savage happily mentioned.